A host of Tigers defenders look to prevent a Mansfield Senior shot on goal during their contest on Wednesday afternoon in Galion. The visiting Tygers won the game; 2-0. GALION —The Galion Tigers boys soccer team wrapped their 2017 regular season on Wednesday, hosting the visiting Mansfield Senior Tygers. In a competitive match, it would be the Tygers coming out on top, 2-0 over the Galion squad. The Tigers finish the season at 0-11-2 overall and 0-6 within the Mid-Ohio Athletic Conference. The duo of Stephen Thompson and Quinn Boland were in the net as goalkeepers for the home team and recorded 21 total saves, 15 and six, respectively. Offensively, Galion had 10 shots on goal against Senior but were unable to find the back of the net for a score. Sam Rigdon, Hunter Parsley and Jason Guthridge all managed two shots apiece while Skyler Bishop, Devin McCarthy, Kyle Bauer and Boland all finished with one shot on goal apiece. Up next for Galion is their postseason match at Lexington on Monday, Oct. 16 where they will face-off against the hosting Lexington Minutemen at 5 p.m.
GALION — On Monday, Oct. 9, the Galion Tigers boys soccer team hosted the Buckeye Valley Barons in their final MOAC match of the season. Unfortunately, the visiting Barons would shutout the Tigers by a tally of 6-0. McCarthy managed three shots at the net but the goalkeeping from Buckeye Valley prevented a single shot to enter the net. Guthridge and Thompson finished with one shot on goal apiece for the Tigers as well. 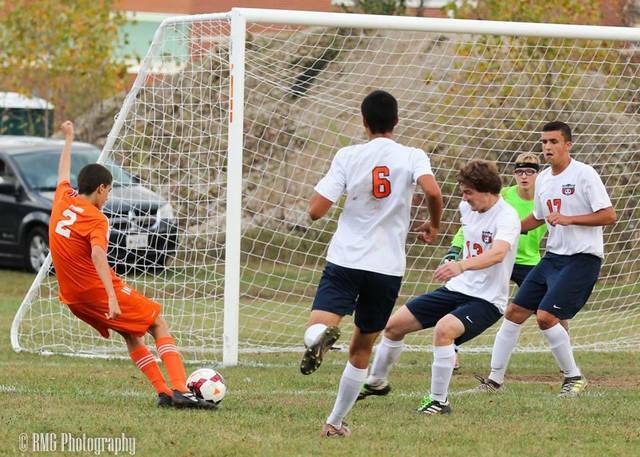 Thompson had six saves during his time as goalkeeper and Boland chipped in five saves for Galion. https://www.galioninquirer.com/wp-content/uploads/sites/38/2017/10/web1_shot-on-goal.jpgA host of Tigers defenders look to prevent a Mansfield Senior shot on goal during their contest on Wednesday afternoon in Galion. The visiting Tygers won the game; 2-0.